It’s hard to believe I took a break from Blogging more than a year ago to finish my book and now it seems timely to re-start the engine. While I do have some good news about my book, I’m going to save that for another day. To Rochelle’s family, to Russell – her partner of 19 years – and to all her friends, my sincerest sympathies. We all feel her loss so deeply. 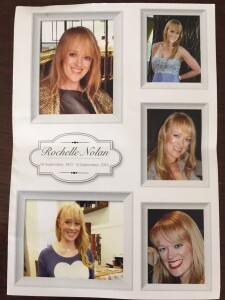 Many subscribers to this Blog will remember Rochelle as the beautiful model who posed for any Fashion Posts we covered and I have so many happy memories of those times we spent together. I was also glad to have so many lovely photos of her that we could use for the service to remind everyone of her stunning smile that could light up any room in a flash. 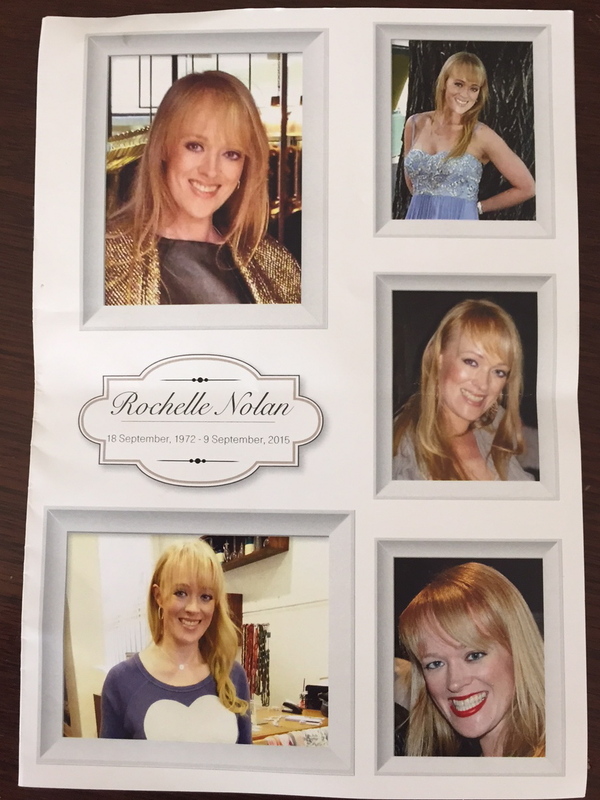 Hundreds turned out yesterday for Rochelle’s farewell that was held at Brighton’s Baptist Church. So many people came that the church was overflowing with crowds spilling on to the street. She would have loved that. 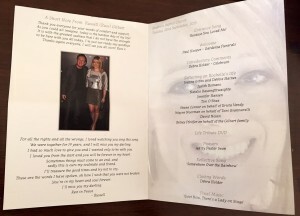 Inside the Order of Service, Rochelle’s partner of 19 years, Russell, told of how much he loved Rochelle and how much he will miss her. The words below are from the tribute I read at the church. Along with several dear friends, we stood side by side to talk of our love for Rochy, shared stories, tears and many hugs. Writing is something Rochelle and I both loved. Telling stories and finding the right words to express ourselves. Which also meant lots of swearing and being outrageous. We even started our own writing workshop. A couple of other writers joined us. Some came, some went but we were the two main-stayers. Which is why I have to apologise to Rochelle that this tribute I’ve written isn’t really up to scratch. That’s because I haven’t spent enough time on it. I had the time on the weekend. I could have spent hours. But I kept putting it off. And I know why. Because to write a farewell tribute to your dearest friend means they really have gone and that finality is something I still find so terribly hard to accept. Rochelle IS irreplaceable. SO many shared emails which I now treasure and have spent hours collating so I can still hear her voice. At writing classes, teachers bang on about how important it is to ‘find your own unique voice’ Rochy had that instantly. A writing style that was direct and heart-wrenching with her own unique cutting-edge, wicked sense of humour. Rochy spent several years working on writing her own book. Titled AnonyMS – it was a play on words that also incorporated the letters MS, as a reference to that disease which she so hated. I went to hospital with Rochelle for the first of her monthly transfusions and shared the journey when she was on the road to being diagnosed. It was a very painful time for her and one she documents in her book. I hope one day I will be able to, with Russell’s blessing, help collate the chapters we have together and have her book published in some form or another. It was not long after her diagnosis in 2009 that I told Rochy I’d be going to LA and Vegas for a trip marking a film launch – a project I’d been involved in for some time. After going through such a rough patch – learning she had MS – Rochelle spoke longingly of how she too would like to visit those places. When I look back on our friendship and see how much Rochy bought to my life, I will be forever grateful I was able to do at least one thing in return. Thanks to film producer Bobby Galinsky, we were able to make arrangements to include Rochelle on this trip and by God, it was indeed the trip of a lifetime. We were both convinced we were MUCH better looking in LA, so armed with that boosted confidence, we took the town by storm and wreaked havoc. 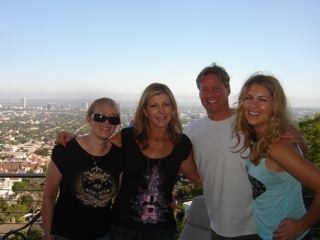 We teamed up with our good friend Krista and called ourselves the Three Amigos. So many adventures and great memories. As soon as we came home, we promised each other we’d do it all again. To living the high life with the filthy rich. 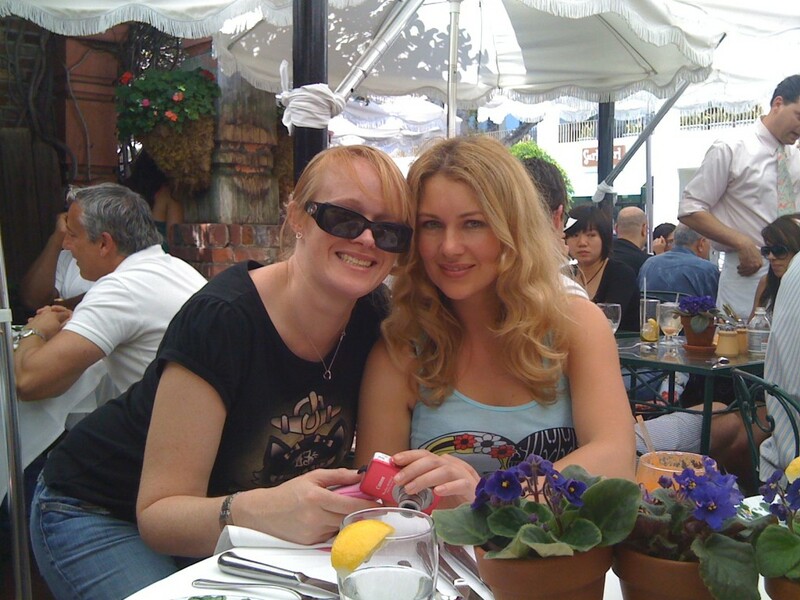 There was so much we had in common that bound us together – as Rochelle described in an email, we were ‘besties’. Although another time, after seeing the musical, AVENUE Q, she described me as her BAD Ideas Bear, meaning I was the one who led her astray. Yeah, maybe, but I think she liked it. 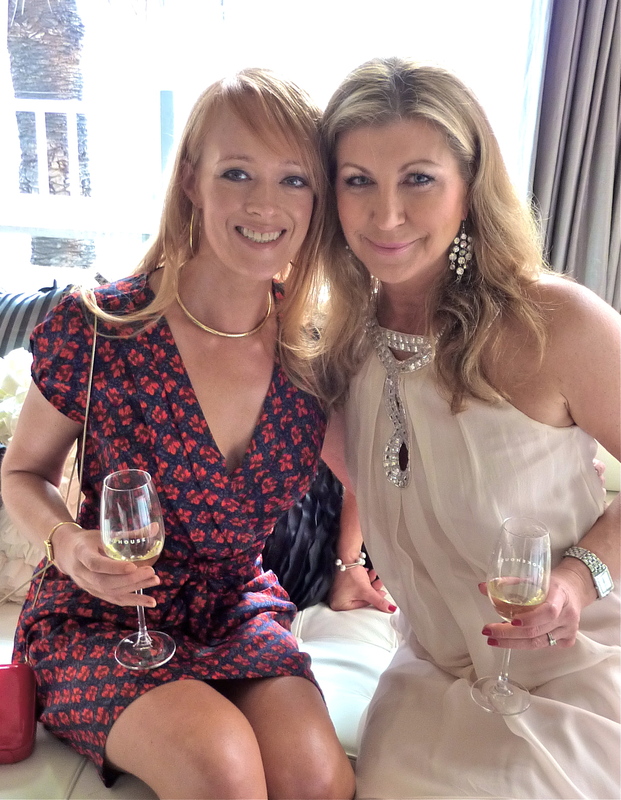 Our common interests included a love of Rose gold jewellery and clothing, fully-oaked chardonnay, movies, Oscars, music, writing, books, karaoke, singing and champagne. It was Rochelle who named our favourite bubbly Moet and Hansen in my honour. I will forever call it that. Not so brave today…. But how wonderful to have a friend who gives such positive and unconditional love and support. Other friends of mine who met Rochelle – who are here today – like Sam, Julie and my sister Jill – also loved getting to know Rochelle – each saying the same thing – because she’s such a genuine person and doesn’t judge people. Rochelle was so talented on so many levels. Her writing and her sharp wit for starters. Beautiful too – inside and out. She was a regular model for my Blog and shone in all the photographs – some of which you will see in the photo tribute shortly. What a smile and so photogenic. She was a superb singer – the only one in the room when we had a karaoke night that people would actually stop talking for and listen to her sing – she was brilliant. Rochy WILL always be in my thoughts in this world and I know later, when it’s my time, we’ll see each other in that OTHER world – wherever it is – a land where they only serve charonnay; where Tim Curry is singing at a Vegas-style party amid cats and laughter. In one of her recent emails to me Rochelle finished up with saying ‘Love you dear friend of mine, till the end of time.’ Ditto my darling. This entry was posted in Opinion and tagged Chardonnay, Karaoke, PAN, Pan the movie, Rochelle Nolan, Rochy, Rose gold by JenniferHansen. Bookmark the permalink. Hey Jennifer. I just want to say, your words are beautiful. I was good friends with Rochelle, even though we only met in person once at hospital in Melbourne we emailed frequently for years. She called me ‘Internet dude’ and I called her ‘Internet chick’..
She helped me through so so many dark times. As well as just being a priceless friend. It’s still hurts so much every time I remember I can’t just wright to her, or I won’t be getting any random mail from her (many in the form of a poem).